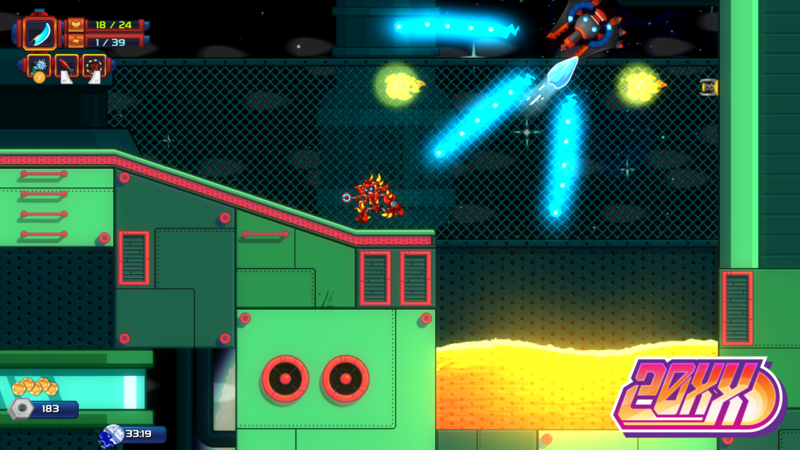 Mega Man X…errr…I mean 20XX just blasted its way onto consoles July 10 and what a rush the game is! This Mega Man-inspired platforming treat released on the PC back in August 2017 after an Early Access phase that felt like forever. If you couldn’t tell from the first line of this article, 20XX looks and feels like it belongs in an amped-up version of the 16-bit era. The game is essentially a love letter to the tight, responsive platforming seen in Capcom’s Mega Man X, Mega Man Zero, and Mega Man ZX games, with some really unique twists tossed in throughout for good measure. For one thing, the game has permadeath, which means that once you die in a run (on the typical difficulty settings, at least) your session ends and the game kicks you back to the main hub area. However, this harsh mechanic is offset by the fact that throughout your platforming journey you collect a special type of currency that you keep despite defeat, allowing you to purchase special power-ups and stat-boosts to use on your next run. And, in case the “one strike and you’re out” mechanic is a bit too harsh for your play style, the developers have added a more forgiving mode that allows you three tries per run. Another neat thing about 20XX is the fact that the levels are procedurally generated, meaning that no playthrough of the game will ever be entirely the same. This isn’t just a random generation of a stage’s layout, but this also means that power-ups, special challenges, armor upgrades, and more are all chosen at random and their locations are also random each game session. Also, while 20XX doesn’t present you with a traditional stage select like you might expect from a mainstream Mega Man title, at the completion of each stage you’re presented with a reward followed by a choice between one of three stages to take on next, giving you a bit of personal agency as many will have come to expect. As someone who’s followed the game’s development since the very early days of Early Access on Steam, this is one I have no problem recommending if you’re at all a fan of these types of platformers. It’s also something fantastic to play while waiting for the upcoming Mega Man 11 that’s due out this October. Currently, you can pick up a copy of 20XX on the PC, PlayStation 4, Xbox One, and Nintendo Switch.